Tindora or Ivy Gourd is one of my favourite vegetables. Since childhood I’ve always been accustomed to one way of eating and now making Tindora – boil it and season with ground garlic, coconut and chili powder. 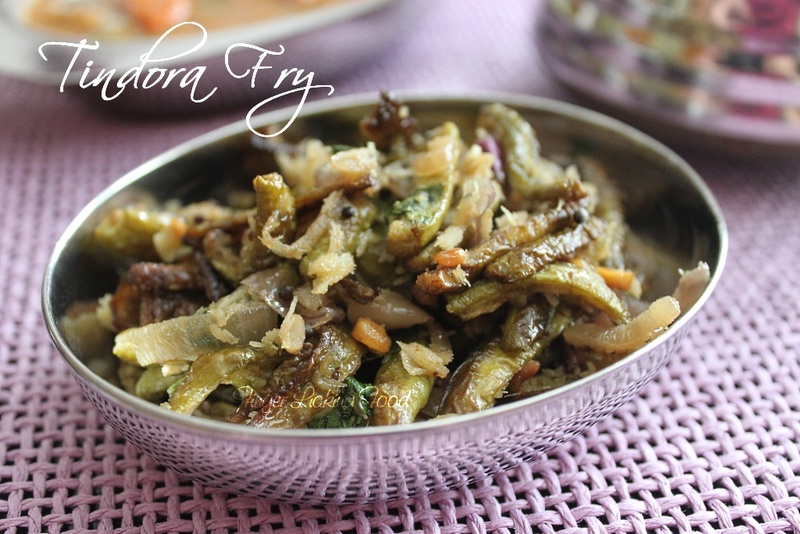 Tindora Fry is how it’s made in Andhra, also known as Dondakaya Fry. 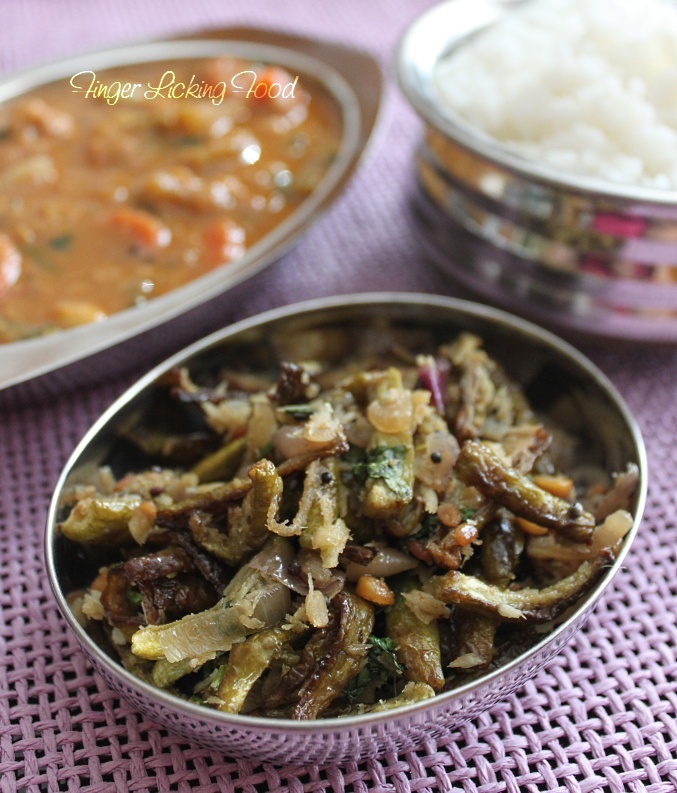 It is a very popular dish served along an array of mouth-watering Andhra dishes.This is now my new favourite way of making Tindora. Wash the Tindora and trim the ends. Cut Tindora in half lengthwise and cut each half into fourths. You should have four thin pieces from each Tindora. Heat 2 tbsp oil in a non-stick pan that is wide enough to accommodate all Tindora in one layer. Add the Tindora and sauté on medium-low heat. The key is to cook the Tindora until the edges are crisp and the Tindora shrinks. Stir every now and then to prevent burning and to ensure the Tindora cooks on all sides. It takes about 12-15 minutes, the wait is well worth it! When the Tindora is almost done heat the remaining oil in another pan. Add the mustard seeds and curry leaves. When it begins to splutter, add the urad and chana dals. Saute until light brown for a few seconds. Add the sliced onions and ginger garlic paste. Saute until the onions are translucent and soft. Now add the cumin powder and grated coconut. Saute for a few seconds and add this to the Tindora. Toss and season with salt. Cook for a minute more until the cumin is fragrant. Turn off heat, garnish with cilantro and serve. Nothing hits it home like a yummy and aromatic Vegetable Sambar which brings back a host of memories from India. 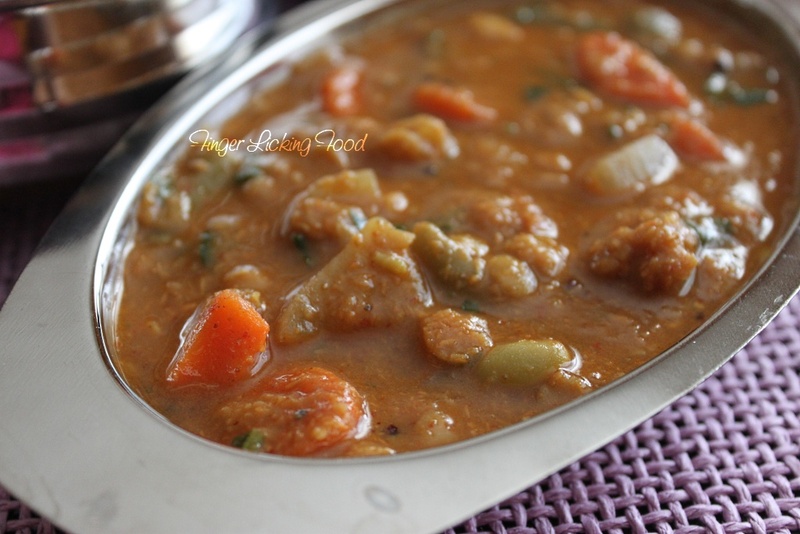 The Sambar is a quintessential part of a South Indian meal. The way it’s made varies widely from household to household – what goes in the sambar as well as the spices used to make it. 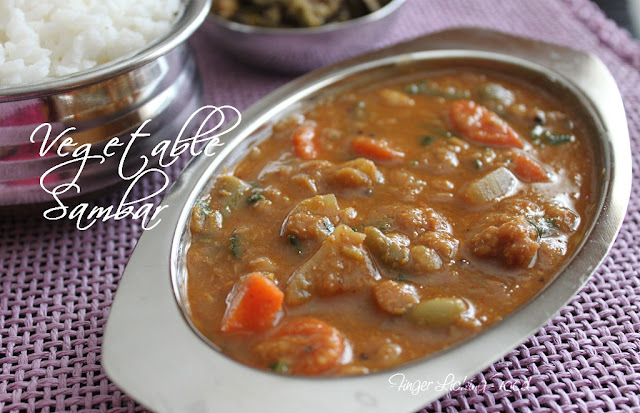 The most comforting and a family favourite is the Vegetable sambar. ** In the US, I prefer to use frozen Lima beans which cuts cooking time. I buy it at my Indian grocers – Surti Lilva is the tender smaller lima beans; Valor Lilva is the larger lima beans preferable in this sambar since it holds shape better. Dry roast each of the ingredients above in a small pan, until light brown and fragrant. Cool and grind to a fine powder. Grind to a smooth paste with water as required. Wash Tuar dal and drain. Add the prepped vegetables to the tuar dal, add water until everything is just submerged, about 2-2.5 cups of water. Add a pinch of turmeric and ½ tsp of oil. Pressure cook for 3 whistles in a pressure cooker. Let cooker cool before opening the lid. In a wide pan, heat the oil. Add the mustard seeds, curry leaves and hing. When it begins to splutter, add the pressure cooked dal and vegetables. Add the tamarind paste, powdered jaggery, salt to taste and prepared ground paste. Stir well to combine and bring to a boil on medium heat. Simmer for 5 minutes. Turn off heat and then garnish with cilantro. Serve hot with white rice. The tindora dish sounds delicious. Our recipe is simpler. I love tindora too and your sambar looks so different - i don't add garlic usually. Must try your version. Awwww... can't take my from those beautiful pictures.. Awesome job dear ! !